PSA Seminar Series: Part 1. The Political Science Association is proud to announce our first instalment of our seminar series! This is an opportunity to learn more about important political issues from some of UWO’s finest Political Science professors. 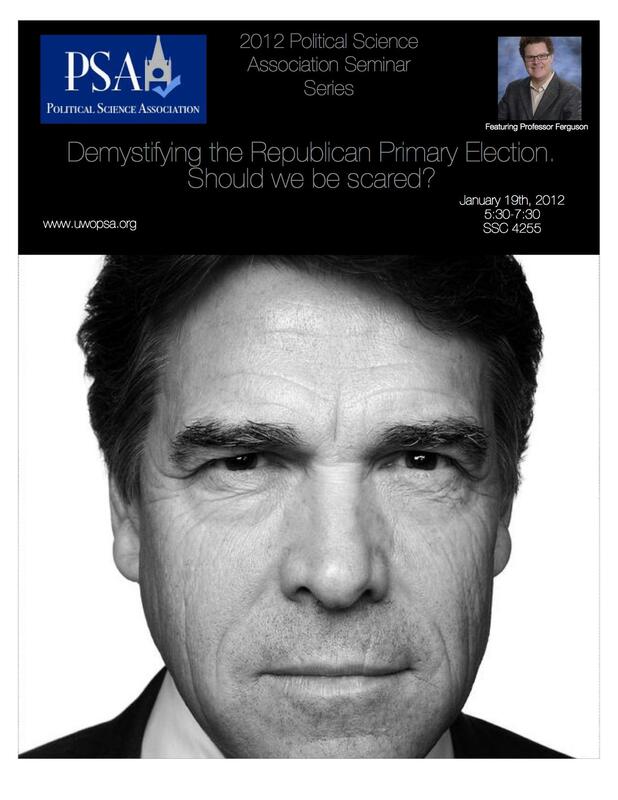 Our first instalment is ‘Demystifying the Republican Primary Election – Should We Be Scared?’ The executive committee has received a lot of feedback from students who want to learn more about the upcoming Presidential election. The seminar will take place Thursday, January 19, 2012 at 5:30pm in SSC 4255. We are proud to welcome Professor Ferguson who will be leading the discussion and sharing his thoughts. Be sure to check back for more exciting seminars this semester!